Borderlinx | Buy Pioneer and ship worldwide with Borderlinx. Cheap rates guaranteed. Power up your home, hook up your dreams, and discover Pioneer USA today. Pioneer USA was founded over 70 years ago, and since then, has never lost sight of the powerful innovation and spirit poured into each and every one of its products. From the very first CDs, to the first CD players and GPS systems, to today's fast-paced electronics market, Pioneer USA has remained a global leader in electronics. Create your home theater, revamp your computer system, or modernize your car along with tons of other amazing projects that you can tackle with the power of Pioneer USA electronics. Pioneer USA is a global leader in so many areas that customers have only one place to look when it comes to home, car, or even bike electronics such as cycling computers to track and record metrics about your ride. Pioneer USA headphones come in standard and earbud styles, and offer cutting edge noise-cancelling technology. Pioneer USA products are powerfully inventive, ranging from DJ equipment to tablets and car GPS systems, and are all available for competitive prices. Home theater speakers, for example, can start from under $100, and vehicle CD players under $150. 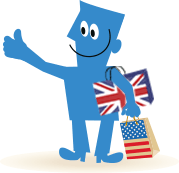 International customers can now buy Pioneer in the USA with Borderlinx! With cheap shipping, tax & duties calculated upfront by our Shipping cost calculator, Borderlinx will ship your order to your home country! Additional services such as concierge, free repacking, and consolidation are available through Borderlinx to make international ordering from Pioneer USA hassle-free!